… You were expecting my usual warning about spoilers, weren’t you? Pee-wee’s Big Holiday is a terrific movie to see “blindly” (meaning “without knowing too much about it”). So, outside of what’s shown in the trailer, I’m going to refrain from referring to anything too explicitly. This way, if you’ve seen the movie, you’ll know what I’m referring to, but if you haven’t, you’ll still be surprised when you do. All right, let’s kick this into high gear! The running gags, the small details that become important later, the wordplay, the quirky characters, the wonderfully wacky and weird absurdity… it’s all classic Pee-wee Herman! Who DOESN’T want their morning routine to be a finely-tuned Rube Goldberg device?! No matter how many times I see Pee-wee Herman do the “balloon trick” (including, most recently, on The Tonight Show Starring Jimmy Fallon), I laugh until I can’t breathe. I start laughing as soon as Pee-wee takes out the balloon! Between the sounds the balloon makes and the faces Pee-wee makes, if you don’t at least smirk by the end of it… I don’t know what to tell you. The humor in Pee-wee’s Big Holiday is consistently fun and offbeat, just like Pee-wee Herman himself. As with most comedy, whether or not you’ll enjoy the film is all about your sense of humor and what you find funny. Personally, I find pretty much everything Pee-wee Herman does funny. You’ll notice references to many of Pee-wee’s past projects, from cameos to gags to catchphrases. Pee-wee’s Big Holiday strikes a wonderful balance of preserving what’s important about Pee-wee and what makes his adventures work so well while also charting new territory, ensuring that both new and seasoned fans will be surprised, engaged, and satisfied. Speaking of catchphrases, I’ve always loved how each new Pee-wee Herman project gives him new catchphrases, and Pee-wee’s Big Holiday adds some great ones! Your new excuse to get out of anything. Thanks, Pee-wee! I’ve never really been someone who watches movies or TV “ironically.” Pretty much every movie or TV show I watch, I watch because I get genuine enjoyment out of it. Luckily for all of us, Pee-wee Herman projects are perfect for that. Cynicism is so dominant now, it’s wonderful for me (and, I’m sure, for others like me) to see someone else who chooses to counter it with its greatest weakness: genuine joy. One thing that seems to connect all Pee-wee Herman fans is that we’ve all been “the weird kid.” I was so weird as a kid that I wore it like a badge of pride: to this day, I think of “weird” as a compliment. As I’m sure is the case with most “weird kids,” things got rough socially in middle school and high school. Luckily, it was right around that time that I accidentally discovered Pee-wee’s Playhouse, and, by extension, Pee-wee Herman. If Pee-wee Herman and his fan base could exist, then that meant other “weird kids” existed in the world. And that’s not just cool, that’s triple cool. 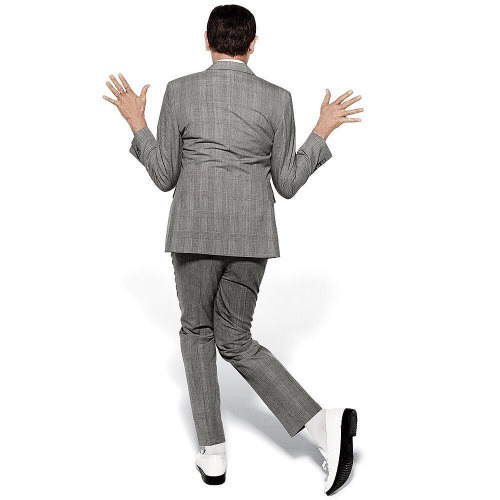 Thank you, Pee-wee! Anyone who does something like this is triple cool in my book. My younger brother, James, has special needs, so it can be difficult to find something we can enjoy together. When I showed him Pee-wee’s Big Adventure, he was instantly “hooked on Herman”! He loves Pee-wee’s Big Holiday and can’t wait for more! Again, thank you, Pee-wee! Here’s a random fact about me: watching Pee-wee Herman cry always breaks my heart. I don’t use that phrase lightly. Maybe it’s because he’s usually so happy or, if he’s not, he’s at least sarcastic. Maybe it’s because he’s just such an endearing and delightful character that you can’t help but love and care about him. Maybe it’s both of those things. Maybe it’s another thing. Whatever the case… gosh darn it, Movie! I hope you’re happy that you sent my soul through the wringer. … Aw, who am I kidding? (No one, that’s who.) I’m not really mad. That’s the sound of Pee-wee Herman calling my bluff. If you love Pee-wee’s Big Adventure, Pee-wee’s Playhouse, and/or The Pee-wee Herman Show on Broadway, you’ll love Pee-wee’s Big Holiday. It’s goofy, it’s fun, it has an emotional through line to tie it together, and best of all, Pee-wee is still Pee-wee! 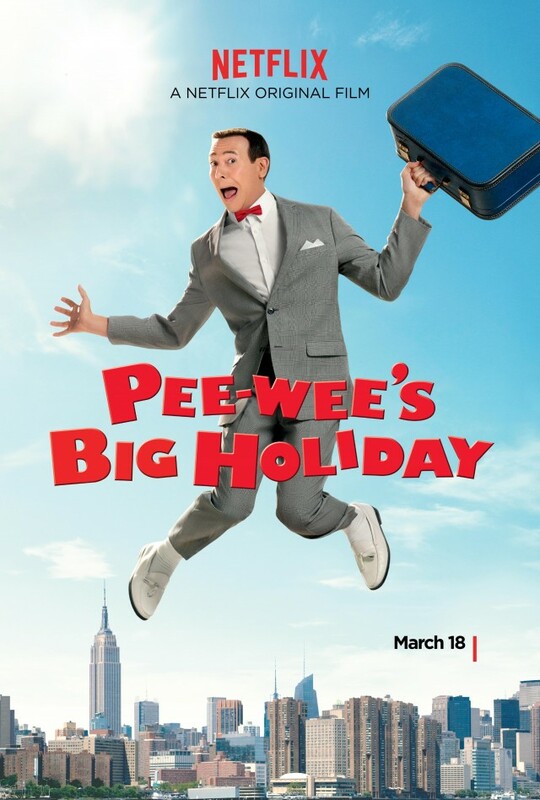 I only wish I could see Pee-wee’s Big Holiday in theaters. As much fun as it is to share it with my family and friends in small groups, there’s also something special about a bunch of strangers coming together to experience a story together. Still, I’m just happy there’s a new Pee-wee Herman movie. By far, one of the greatest things about Pee-wee’s Big Holiday is that its quality will leave new audiences and seasoned fans alike cheering and begging for more Pee-wee Herman! We want more Pee-wee, please! Everything sounds cooler with a motorcycle rev. And race to Netflix as fast as you can to join in the fun on Pee-wee’s Big Holiday! It looks like this option gets a thumbs up! Whatever floats your… okay, wrong choice of words. Now THIS looks like a “wheelie” rad way to travel! You’ll love it so much, you’ll want to marry it! … Okay, okay, you convinced me… Here’s that clip of me doing Pee-wee Herman’s famous “Big Shoe” dance to promote Dance Marathon, a charity event I was a part of at Northwestern University.